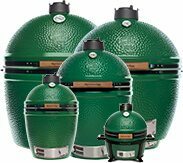 Precise temperature control is what the Big Green Egg is all about! 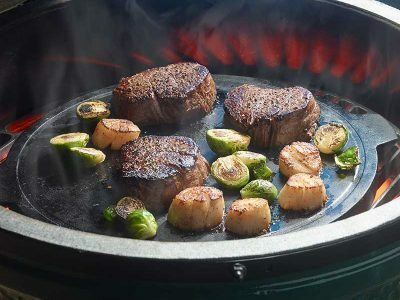 So how do you control temperatures in the Big Green Egg? Simply by adjusting the patented air flow controls. The Big Green Egg’s Draft Door and the Dual Function Metal Top work together to regulate the amount of air flowing in and out of the EGG. The Draft Door allows you to set your target temperature range, whilst the subtle adjustments to the Dual Function Metal Top, enables you to achieve very fine temperature control. Small quantities of incoming air produce small, low temperature fire capable of working for many hours. 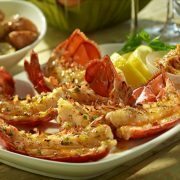 Larger quantities of air produce a bed of red hot coals that will burn hotter and faster. When both vents are open fully, the fire will quickly accelerate and your Big Green Egg will rapidly reach temperatures in excess of 300°C (575°F). Do not leave the dome lid open when cooking for more than 10 minutes. Opening the lid increases the amount of heat generated and causes temperatures to increase rapidly. Unrestricted charcoal can burn at temperatures in excess of 2500°C (4530°F) and this can result in damage to the EGG’s ceramic. Always BURP the dome lid before fully opening during the cooking process. Raise the dome an inch or two to pause and burp it before opening the dome completely. This allows the sudden rush of oxygen to burn safely inside the EGG and not as a flashback that could potentially startle you and cause possible injury.